Patz Corporation is pleased to announce the new 1600 Series II Twin-Screw Trailer Vertical Mixer as the next evolution in Balanced Flow™ Technology. The Series II offers Precision Feeding Trailer options and features an affordable, re-designed uni-body frame. The new 1600 Series II 620 Vertical Mixer includes an optional front door with multiple front door conveyor discharge options. The front discharge conveyor is trailer mounted only. A standard viewing platform for monitoring TMR mixing and recessed LED lights in rear bumper are added safety features. This mixer also has (4) 285/70R19.5 Hybrid Implement tires with DOT spec’d truck sidewalls (duals). Standard 1600 Series I and II Balanced Flow™ features include Patz Patented contoured baffles and twin Tru Taper™ V-Screw with Dual Kicker (34” or 44”). Choice of screw top options include cone or multi-angle depending on ration being mixed. Four hitch types are available: clevis, single tang, articulating ball, and BullPull™. Drive packages offered are a manual 2-speed or 1000 RPM Direct Drive package. The Patz 1600 Series I 620 Vertical Mixer will continue to be offered. variety of ingredients, from large round or square bales that are wet or dry. Our vertical mixer line offers a consistent TMR from start to finish, regardless of the batch size. 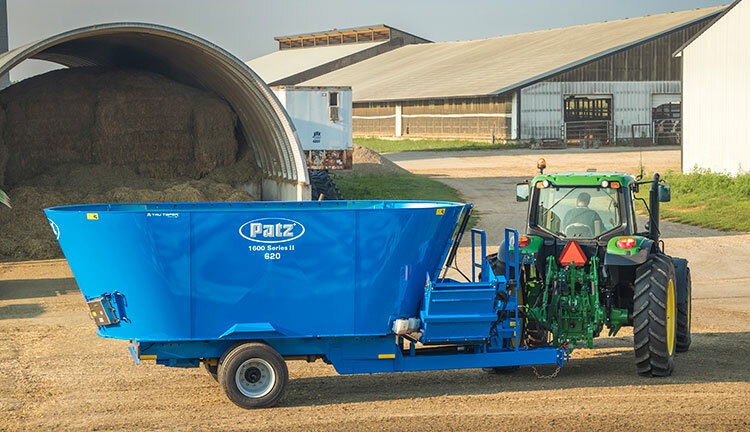 Patz Corporation designs, manufactures, and markets agricultural, industrial, and environmental products as well as offering contract manufacturing and finance options. Patz Corporation’s rich history boasts 70 years of success. We continue to thrive in an ever-changing market by listening to the needs of the diverse customer base we serve, ranging from small dairies to large corporate farming operations to commercial businesses. For more information, visit www.patzcorp.com.